Cranberry and orange is always a great combination in my book and adding cinnamon, nutmeg, ginger, clove and white pepper gives it a nice twist. When I see cranberry and orange anything together I think of the holidays like Christmas and Harvest time. While watching my favorite television network, Food Network, I got the idea for this recipe when they made a mulled wine. Mulled wine is made with dry red wine or non-alcoholic apple cider, cinnamon, ginger, orange, clove, nutmeg, pepper and cardamom. I took the spices like the ginger, cinnamon, clove, nutmeg, and pepper from that and created this recipe. I've made doughnut muffins in a previous post you should check it out. 1. Zest two or three naval orange then juice them. Whisk together granulated sugar, melted butter, canola oil and spices until well combined. In a separate bowl, combine flour, baking powder and sea salt. 2. Add three cups of flour, two eggs, and 1/2 of buttermilk. Whisk together. Add 2 1/2 cups of flour, eggs, and buttermilk. 3. Toss together orange zest and dried cranberries with the 1 cup of flour then fold into muffin mixture. 4. Chill in the refrigerator for 3 hours or overnight. I recommend letting the batter chill overnight, it lets the spices immerse into the dough. 5. Preheat oven to 325 degrees. Spray muffin pan with nonstick cooking spray. Fill each cup 2/3 way full. For regular size muffins, bake for 15 to 20 minutes. For Jumbo or King Size, bake for 25 to 30 minutes. To check to see full baked stick a toothpick in the center and if it comes out clean they are ready. 6. Cool in the pans for 10 minutes then tip over to a wired rack and let them cool before consuming. Store in cool place in airtight container. Lots of holiday flavours for sure. A cross between a donut and muffin works for me. My kind of breakfast. Like the flavors used in this muffin recipe. Have to try it. I agree cranberry and orange are always a great combination. This sounds so wonderful. I can almost smell the spices..! yum! These look AMAZING! I am going to have to try them soon. Thanks for posting this recipe! I love the combination of orange and cranberry as well. These sound great! Cinnamon, ginger, cloves and pepper screams holidays and winter to me. Love these. This sounds amazing, I cannot wait to try it! mmmm these sound SUPER tasty! Probably because you got the idea from mulled wine and I am obsessed with mulled wine! We moved to Colorado from Florida last year so it was my first white winter and all the restaurants around here serve mulled wine and I couldn't get enough of it! I'll definitely have to try making these muffins! Oh man, I wish I could pluck these muffins off the page. I am definitely using this recipe. Thank you so much and those combinations of spices sound magical. Thank you so much! 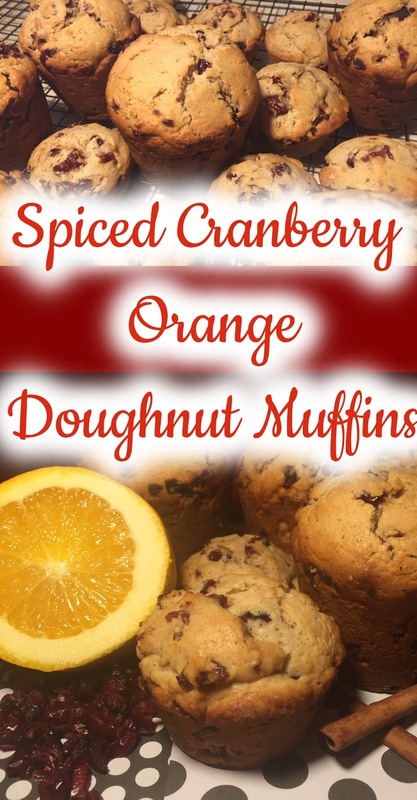 Cranberry and orange is a lovely combination and I love the spices in these too. They are perfect for this time of year. These look super delish! Love the staging of the photos too! Yum! These sound like a great breakfast or dessert! Thanks for sharing! This sounds delicious! I've made mulled wine cupcakes before and loved those. I bet I'd like these too. Some of my favorite holiday recipes call for clove and ginger! I think I may have found my Thanksgiving morning brunch treat! These look great and are perfect for winters. All those aromatic spices will make them smell heavenly! These are some of my favorite flavors! What makes it a doughtnut muffin though? I didn't understand this title. The muffins look great though. It's great that you can chill these in the fridge overnight - I can make the batter the night before and then bake them in the morning filling the house with the warm scent of spices and getting everyone out bed for warm doughnut muffins and coffee! Those sound so amazing! With the cranberry and orange, they're perfect for a fall breakfast with my little people. These doughnut muffins sound and look amazing! I love the thought of making fresh hot muffins in the morning for my family. This recipe is so detailed and creative. I'd love to try out this someday. Thanks for sharing! These look and sound absolutely wonderful, and very seasonal. And I'm a huge fan of mulled wine and mulled cider, in fact just had my first glass of mulled wine tonight! Oh wow. This is an amazing new recipe to try. I just got a new oven and I am trying out new recipes of all kinds. I was thinking of making cupcakes or muffins next and getting to read this post came just in time. Thanks for sharing! Looks amazing! Have to try this recipe! These sounds like a great holiday addition. They look fluffy and delicious. I love cranberry muffins. I love cranberry anything actually. I made cranberry muffins the other day and totally forgot about them. Well, they were so burnt. These look fantastic! I haven’t tried cranberry and orange together before but feel like drooling over the recipe..gonna try it! Do you know that I look forward to reading a post of yours because you have the same taste as I do? I know it will more than likely have pumpkin or cinnamon in it and that makes me happy. Happy Thanksgiving to you! This recipe sounds delicious!!!! I’m going to make these with my little boy this week. Great recipe! They're too cute to eat :) gotta try baking this over the weekend! This sounds so delicious. The name of it alone is making me hungry. Cranberry and Orange, love both flavors, for sure I am going to try it this weekend. I love the combination of orange and cranberry. My mom used to make quick breads and I make scones. These muffins look like a must try. Pinned it! what a lovely recipe for the holidays! Doughnut muffin sounds delicious! I can't wait to try it. I love this idea! I really love Cranberry and Orange. and I really adore this muffins because all of my favorite is totally here in doughnut muffins. I really love it. Looks so delicious and really tempting.